UPS is piloting a new electronic bicycle delivery program in Seattle – one of the nation’s most traffic-congested cities – a move Boston Bike Attorneys realize could ultimately drive down carbon emissions, expedite package delivery, encourage better biking infrastructure and make the community safer for cyclists. UPS is one of an increasing number of on-demand delivery services that has seen a boom as a result of proliferation of e-commerce behemoths like Amazon. The success of cargo e-bikes over the next year will be measured by a collaboration between the Supply Chain Transportation and Logistics Center and the University of Washington’s Urban Freight Lab, which has sectors that specialize in environmental and civil engineering. City officials say they are looking forward to learning the results of the study, given the mass of large trucks that clog the city’s center. It’s not the delivery giant’s first foray into e-bike deliveries. The company has reportedly already begun testing e-bike delivery programs in 30 cities worldwide, including Portland, Oregon in 2016. Those tests involved the use of tricycles that were electronically-assisted, a wagon situated over the back two wheels holding the packages. Obviously these vehicles aren’t able to carry the same number of packages as the over-sized brown trucks that barrel through the streets every day. However, they are safer for other road users and do less damage to the already-taxed and aging infrastructures in so many cities (particularly in older cities like Boston). The pilot bicycle delivery test in Seattle, which started last month, uses detachable containers that carry up to 400 pounds of packages, presorted per route and neighborhood, returning them once empty. In working with the city’s department of transportation, the bikes will reportedly operate within designated bike lanes, as well as on sidewalks (the wisdom of which our Boston bike attorneys question, but presumably the post-program analysis will clearly show the potential for problems, which includes the possibility of collisions with pedestrians and other sidewalk users – particularly given that part of the test area is in a college town). It is expected to shrink delivery costs for UPS by reducing the amount of gas and automotive maintenance required, as well as eliminating the need for double handling of packages. The company is also testing approximately 9,300 low-emission vehicles worldwide. Boston may soon be the site of a Bike Share War, and there could be serious repercussions for the pace of Boston’s cycling infrastructure growth. 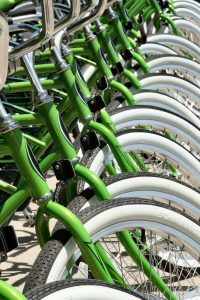 The City of Boston founded the Boston Bikes program in the fall of 2007, with Hubway launching in the summer of 2008 with 600 bicycles and 60 stations citywide. The number of bikes and stations have expanded since then, with the city now reporting by the end of 2018, there will 245 stations and more than 2,400 bicycles. 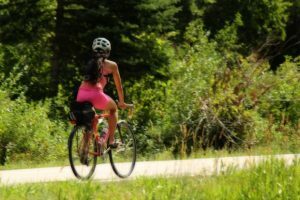 Boston bike injury attorneys at BikeAttorney.com recognize this has been a huge investment for the city and taxpayers, and it provides incentive for city leaders to continue investing in complete streets that incorporate more bike-friendly features, giving riders more ease and confidence. However, there are a number of businesses now vying to capitalize on Boston’s growing bicycle enthusiasm. 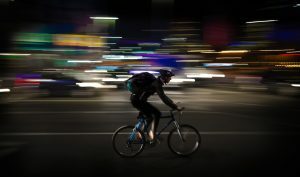 As The Boston Globe reported in October, several firms offering on-the-spot bicycle rentals in Greater Boston have begun trying to work their way into the market. One of the unique advantages these companies have over Hubway is they don’t need fixed docking stations. Instead, renters can park and lock the rental bicycle virtually anywhere. The demand for more protected bike lanes in Boston has become insatiable. 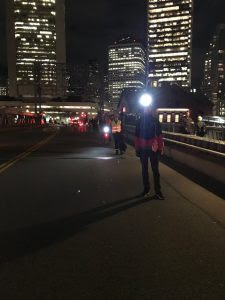 This was underscored – quite literally – across the Congress Street bridge, connecting the neighborhood of Fort Point to the Financial District. The Boston Globe reports an anonymous bicycle activist painted a shaky white line between the barrier-protected pedestrian walkway and the rush of traffic. Periodically inside those lines was a roughly-drawn bicycle, indicating the clear intent was to carve out a safe space for cyclists. Reactions within the cycling community have been largely positive, with some commenting the “artist” behind the guerrilla-style streetscape was heroic and “brilliant.” Tweets from all over the world were shared, many noting this is a major bicycle route through the city – and one where bicycle safety needs to be a top priority. City officials were quoted as saying that while they appreciate the sentiment, bicycle lanes must go through a full proper review of the engineering process. But there had been a review, as there had been a bicycle lane on the bridge before, that had worn off over time. Then City workers power-washed off the spray-painted line along the northbound lane.